*The fabric a little dirty. 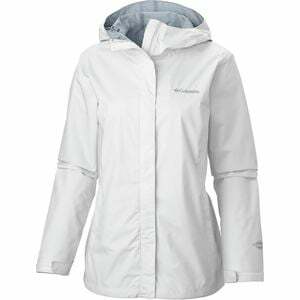 If you're looking for a reliable shell at an affordable price that you can bring along just about anywhere, the Columbia Women's Arcadia II Rain Jacket will do just the trick. The jacket packs down into one of its hand pockets, so you'll never have to leave it behind, but its Omni-Tech laminate and fully taped seams provide waterproof protection whether you're on the trail or in town. Omni-Tech is also highly breathable, meaning it lets moisture, like perspiration, escape for comfort when you're working up a sweat. The jacket's mesh lining enhances ventilation so you don't get overly clammy in warmer temperatures, or sweat-soaked and cold when it's chilly. Cinch down the adjustable hood and hem if you need extra protection, and protect small essentials from the elements in the secure zippered hand pockets.